Amitabh Bachchan is one of those actors who is a sports fanatic and also believes in sharing his opinion on his social media platform - Twitter. As known to all, social media is also a platform where celebrities face immense scrutiny from the general audience. They spare no one and this time it was the Shahenshah of Bollywood - Amitabh Bachchan who became a subject of trolls. As known to all, last night it was the FIFA 2018 world cup final between France and Croatia, which led to France's win with 4-2 against Croatia. 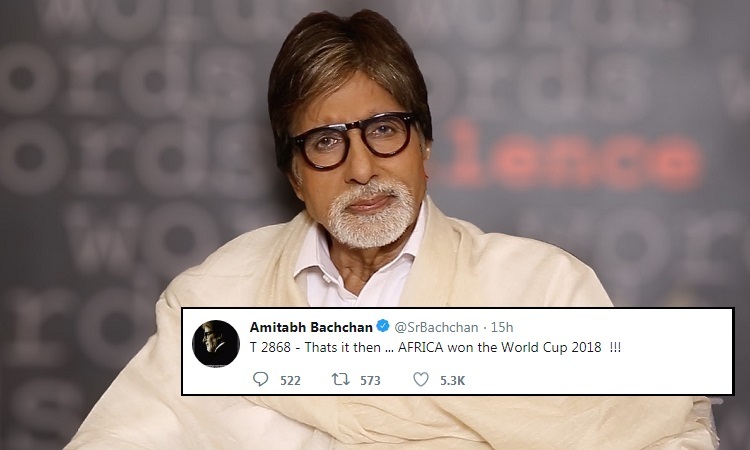 While the world was congratulating France, Big B tweeted, "Thats it then Africa won the World Cup 2018"
In no time, the fans and the audience went haywire and they started savagely trolling the superstar. But before you read the comments, let us tell you the possible reason behind Big B's tweet. France's team has a majority of African players, so much so, that out of 23 players, 16 belong to the African region. What is your opinion over this issue? Let us know in the comment section below. On the work front, Amitabh will next be seen in Thugs of Hindostan which is slated to release on 7th November 2018. The actor just wrapped up shooting for his next 'Brahmastra' which is scheduled to hit the theatres on 15th August 2019. Janhvi and Ishaan are overwhelmed with the love from their fans What's Katrina Kaif's fitness mantra at 35?